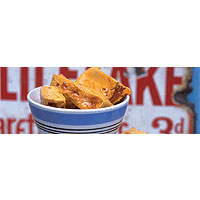 Also known as cinder toffee, yellowman in Ireland or sponge toffee in America, this is a frivolous, bubbly, old-fashioned toffee that is as much fun to make as it is to eat. It reminds me of the old sweet shop at the top of the narrow lane in the village where I grew up. It was a dark, tiny place tucked away in a small row of cottages, as thrillingly tempting as it was scary. Butter a 20cm square shallow tin and line the base with baking parchment. Fill the sink 10cm deep with cold water – add some ice if you have any. Fill a glass with cold water and keep it by the hob. Put the sugar, syrup, vinegar and 150ml water in a very large saucepan (you need to allow plenty of space for the toffee to bubble up). Stir over a low heat, without boiling, until the sugar has completely dissolved. This is crucial. Now stop stirring. Cover the pan and let it bubble for 2 minutes – this will help to dissolve sugar that has set on the sides of the pan. Remove the lid and let it boil until it has reached hard crack stage (150°C on a sugar thermometer). Test for this by taking the pan off the heat and dripping a little syrup into the glass of water. If it is hard and snaps cleanly without stickiness, it has reached the right stage. If not, put the pan back on the heat and carry on boiling for a few minutes longer. As soon as the syrup’s at the hard crack stage, take it off the heat, plunge the bottom of the pan into the sink of cold water and stir in the bicarbonate of soda – it will boil up like a mini volcano erupting. Once it's calmed down a little, stir once more and pour into the prepared tin. As soon as it is cool enough to hold its shape, score the surface into squares with an oiled knife. Leave to set solid, then break into chunks. Very few things in life are more pleasurable than a bit of toffee and a glass of nutty, coffeeish sherry.